Sizhu Li was born in Mianyang, located South West part of China in 1990. Throughout her life, Sizhu has always been fascinated by creating the magic world which based on real society and humility. The interest was cultivated during her very little age and further developed when she opted to take her Bachelor Degree in illustration in China Central Academy of Art. 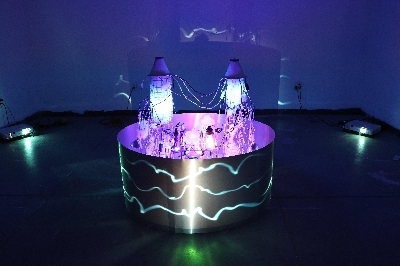 After completing her bachelor degree, Sizhu started interested in interactive three-dimensional works and went to the US to pursue her graduate study. In 2018, she got her MFA in the multi-disciplinary program in Maryland Institute College of Art. 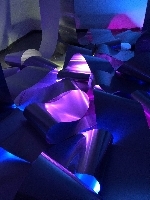 In her current works, she is trying to create magical narrative worlds with integrated, surreal atmospheres, composed of aluminum sheet, found objects, light, air, moves, programming, microcontrollers. She immerses her audience in these dreamlike worlds, seeing, hearing, feeling, and thinking. Envisioning everyday materials with a fresh perspective sparks her imagination to themes of humility, love, science and technique, environment, home. Sizhu had her groups shows in Beijing and Baltimore and her solo show in MICA in 2017. ??? ?In 2018, she won the largest graduate fellowship which award one for academic excellence among all MICA graduating students and her work has been exhibited in BWI airport in 2018. Currently, she is living and working in New York City. I create magical worlds with integrated, surreal atmospheres, composed of real materials, objects, light, colors, air, videos. I immerse my audience in these unconsidered mind-spaces, seeing, hearing, feeling, and thinking. Envisioning everyday materials with a fresh perspective sparks my imagination to themes of humility, love, science and technique, environment, and home. My installations release my visions into the world, offering an image of beauty both ethereal and fragmentary. Each successive project stretches my capacities, both artistic and technical, pushing me into the new creative territory. My works mystify, conjuring a bewildered yet curious reaction. They offer an open space designed not to provide specific answers but to evoke another-worldly experience unique to each viewer. I am not afraid to explore, even if my explorations end in a temporary failure. In the end, failure is the fertile ground for the next artwork. No artistic experiment is ever useless.